Saif al-Islam Gaddafi, chairman of the Gaddafi International Charity and Development Foundation which tried to send an aid vessel to Gaza, says he reached an Egyptian-mediated agreement with Israel on Wednesday, allowing him to infuse $50 million for the restoration of the Strip and transfer construction materials to Gaza. "We go the grapes, so why kill the vineyard guard?" 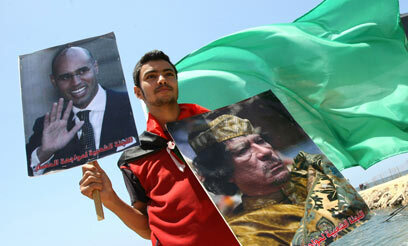 the son of Libyan leader Muammar Gaddafi told the London-based Arabic-language al-Sharq al-Awsat newspaper. "We will soon start funneling $50 million in coordination with UNRWA (the United Nations Relief and Works Agency for Palestine Refugees) to begin rebuilding Gaza and transfer humanitarian aid and construction materials, without any objection on the part of the Israeli government." After days of preparations and intensive diplomatic talks, the Libyan ship docked Wednesday evening at the El-Arish Port in Egypt. Foreign Ministry officials expressed their satisfaction with the positive results of the diplomatic pressure, and some of the vessel's passengers appeared satisfied as well. "We scored points for the Palestinian people and the Gaza Strip," said Youssef Sawani, director of a charity chaired Gaddafi. "The ship's goal was obtained without any bloodshed." According to Gaddafi Jr., "This is an agreement we never expected or dreamed of. UNRWA informed us that it has failed to receive one dollar for the restoration of Gaza so far, and was therefore unsuccessful in bringing in even one iron skewer or sack of cement. "We were also told that they had tried but completely failed in implementing any project of this kind due to the Israeli ban. So from the practical aspect, the Strip restoration issue has been dead up to now." Gaddafi appeared immensely satisfied in the interview. "Through the agreement we've reached, we can now say that the rebuilding of the Strip has begun. The Israelis, in an agreement with our brothers in Egypt, agreed to have Libya infuse $50 million in aid to the Palestinians, through UNRWA, for the reconstruction and inflow of construction materials and ready houses." Asked whether it was an Egyptian-Israeli agreement, Gaddafi replied, "Yes. There is a saying, 'Do you want the grapes or to kill the vineyard's guard?' To tell you the truth, we want the grapes and we got them – so there's no reason to cause any problems. "The problem was not a naval conflict with Israel, but rebuilding Gaza and helping our Palestinians brothers. Especially when you know that there are 5,000 ruined houses in the Strip and thousands of Palestinians without clothes. The problem is that winter will arrive and they'll remain in the same situation. But with this initiative they will be able to live in houses." Gaddafi also revealed how the agreement was reached. "The Israeli defense minister, Ehud Barak, telephoned the Egyptian intelligence chief, General Omar Suleiman. The Egyptians reached an agreement with the Israelis, and we received an official letter saying that they agree to start with the funneling of $50 million for Gaza's restoration. There is an Egyptian-Israeli coordination on this matter, and the guarantee for this agreement is provided by Egypt." See all talkbacks "Gaddafi Jr.: Libya to funnel $50M to Gaza "